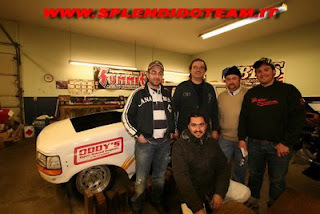 Hi Pullins Fans, from Italy to USA, some pictures about the power-holiday of the Splendido team. The guys in the pictures is Billy Leverentz, the Oddy's Engine owner, and soon will be in Italy to fire-up the V8 in the Sota Spirid modified. Greetings and keep on pulling, always! on my website are photos of weseke. Within any second our new website will be online! It´s completely restyled and we added some nice things too! 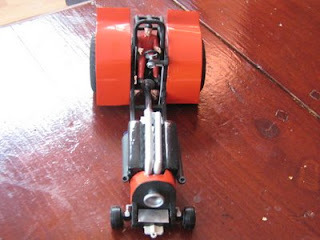 Hi Pulling Fans, the pro-stock teams are very busy in rebuilding the tractor for the 2009 Italian Championship. Nothing runs like a deere? Hopefully is true! Greetings from Dombucci and keep on pulling, always! if you like can you put the pictures on the site. This sunday the outdoor season will start at Borken / Weske. The list of competitors can be found further down this page or click here. Weseke is the home pull for the Heistermann Team (Kiepenkerl & Dragon Fire), the Hawk Team, Boomerang & Smoking Devil and to some extend also Century Fox. The area has a pretty alive Hot Farm circuit and several tractors are going to hook in the 4.5t Sportklasse on sunday, too. 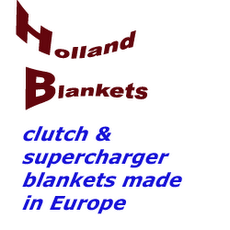 It's located about 2km from the dutch border, between Winterswijk and Borken. The weather forecast is not great, but it is supposed to stay more or less dry (1.5mm rain), so it's pretty sure the event will be held. Rumor has it, the Huntsman Pro Stock of Rob Uphill has been aquired by the Landini company (owner of McCormick tractors) to compete in the 2009 Italian circuit in the hands of the Buffalo 3000 Team. You must remember us as the BMW/Ford V8 from carpulling. Maybe it is possible to set some news on pullingworld? If it can it would be nice. PS: the season start on queens day 30/04/09 in Klaaswaal. Team Lindemann has their new Sportklasse machine done and brought it out to daylight for the first time. The tractor is supposed to have it's first competition at Füchtorf on the 25th of April. The southern dutch "Aerdvruter" component Alky SS starts to look like a tractor by now. Check www.aerdvruter.nl and click on "nieuwbouw" for more pictures. The "provisional" starting list of Füchtorf is now online at http://www.greenmonsterteam.blogspot.com. Also don't miss your chance to get cheaper tickets or VIP tickets on http://www.greenmonstershop.de. Competitors for the Hot Farm classes on saturday are also welcome (need to follow the new ETPC rulebook) and can also sign in through the website. 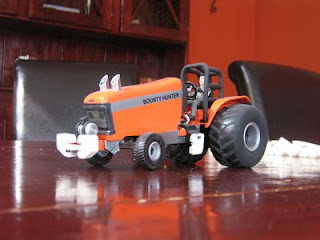 "We have to announce, the Turn Me Loose tractor stayed in the USA because of engine problems. 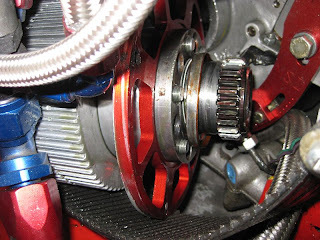 After installing the engine for the European Circuit, the engine had a problem during a test. 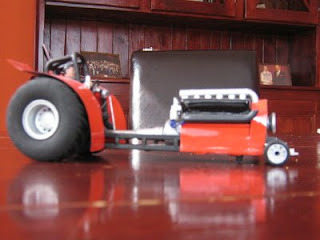 Because of the delivery time of the wrecked parts, it was impossible to ship the tractor in time for the competition in the Gelredome. As team we find this rather sad and disappointing. We would have liked to make our debut in the Gelredome and want to excuse to the fans and the promoter of the Gelredome event. As soon as the engine is running and has been tested, the Turn Me Loose will be shipped to the Netherlands. When exactly this will be possible cannot yet be forseen." I have a new website for you to check out. I put this together for Chad Mayhill at Hoosier Pulling Tires. Our club is on You Tube now so you can see a partial field of what we have. Search Dekalb Super Pull 2009 and look for what this guy calls Econo Hot rods. Hi Pulling Fans, from the land of the sunshine another pro-stock team work around the engine. This time Zancaldi team are busy on the sleeves of the CASE IH Puma name E Ross (the Red One). To finish the installation and do the first setting on the new KAM injection system on the Le Coiffeur's Griffon engine, Ryan and Keith Micke visited the Le Coiffeur Team during the last week. Ryan Micke is a specialist in tuning Electronic Fuel injections for supercharged engines for Drag Racing and Tractor Pulling and has also been working for the Green Monster Tractor Pulling Team. Daily buisiness is tuning Drag cars, mainly the Camaro of his brother Mark Micke, who runs the fastest Drag Car with a centrifugal supercharger (see article here) . The final tune up of the Griffon engine could unfortunatly not be done, as during the test runs a problem with the drive of the Griffon's supercharger prevent the engine to get any boost pressure. The supercharger drive will be fixed in time for the Tractor Pull at Weseke next weekend and there some more test runs will have to be made. During their stay there of course was a little time for sightseeing (Marienfeld Ministry and Bad Iburg Castle) and an evening at the Rampendahl Brewhouse in Osnabrück. Ryan and his brother Mark will be at BAE engines next weekend, dynoing their new Hemi engine for 2009 season, which, equipped with a Pro Charger and a KAM injection system is supposed to make remarkeble more power than the 2700 hp 540 cui Chevy used in the last season. Despite that draw back the Le Coiffeur team hopes to get the engine dialed in soon, to compete in the 2009 Euro Cup season. The Lidköping City Pull joined in as sponsor for the website! ... world's most powerful motorsport! Last weekend Daniel Guggisberg, Hot Farm Puller and ETPC Hot Fam working group leader from Zimmerwald/Switzerland married "his" Nancy! The party I've heard was great with family and pullers from all over Europe! 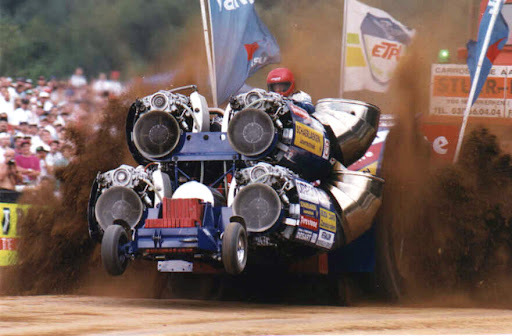 Hi Pulling Fans, some news from the Moretti brothers, the team that manage the tractors from Argo Group, the MkCormick Red Fox and the Landini Bufalo (5 times italian champion in pro-stock). They are working around the Cummins 8.3l... take a look on www.pezzolo.org! I am busy working and actually helping the Le Coiffeur team with the EFI conversion of their Griffon. So - check the pictures below. That's the stuff I currently work on, instead of working on the website much. The german as well as the dutch board are full with discussion about limits and the 4.5t class. We leave the 2.5t alone for the next three years (I think it's in good shape as long as the weight stays were it is. Whether it's limited or not shouldn't make much difference). We change the 3.5t into an 3.6t unlimited (like in the USA). Check and vote in this poll! Bruce would like to know if you could post a comment on your forum for him!?! "We would like to thank everyone for treating us so good! It was very exciting to come over there and pull! We had the best time!! Pro Stock - on the edge! Huntsman back out of the barn!